Another place at Hotel Çakir prepared for you with utmost care is the Yakut Restaurant. Here you can taste open buffets and a la carte menus selectively prepared from Turkish and world cuisines matching all kinds of tastes and preferences. Because of the selected and high quality service we provide in offering best tasting food to our customers favoring their preferences we especially recommend the Yakut Restaurant for render these moments unforgettable. 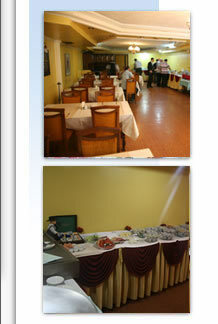 Caring service of our restaurant developed to perfection is at your disposal with its experienced and smiling staff. Tastes of Turkish and world cuisine at dinner sessions will accompany your meetings with your friends.